I have had all of these items in my closet for years with the exception of the Coach bag and watch. The bag was a Christmas gift from my fabulously frugal momma. I picked up the watch at Target on sale before Thanksgiving. Attention teachers! Both the Gap outlet and NY&Co give 10-15% discounts if you ask and show your teacher ID card. 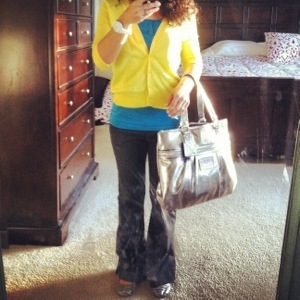 Where do you find your fabulous and frugal work clothes? such a cute look! love the yellow & blue combination!!! Thank you CokaRabbit! I am ready for spring and needed some color!